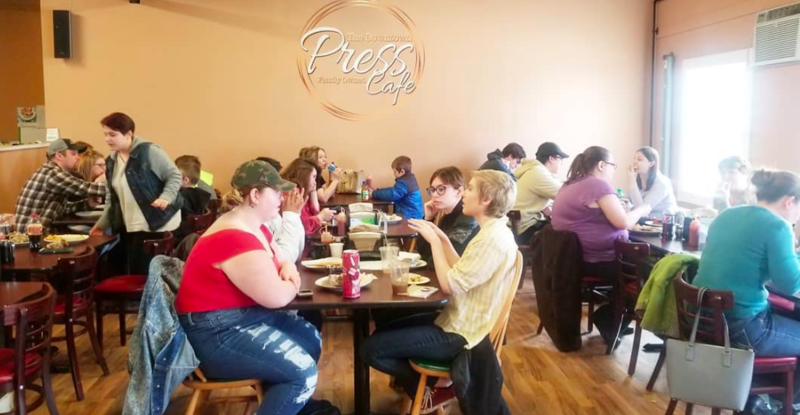 FARMINGTON - Getting things done while simultaneously raising two small children is no easy task, but you don't have to tell that to Brianna and Chris Bracy- owners of the newly established Downtown Press Cafe in Marceau Court. The couple opened their doors just in time for Chester Greenwood Day on Dec. 1 and in just four months have established themselves as a favorited spot for coffee, waffles, paninis and a seemingly endless rotation of speciality pastries and snacks. "I think we're finally ready to start advertising a little. We're getting better at everything so we're starting to get faster," Brianna said. The 42-seat cafe can often be found full, or close to, particularly around breakfast and lunch time. "It's bigger than we ever expected. It's way more of a restaurant," she said. 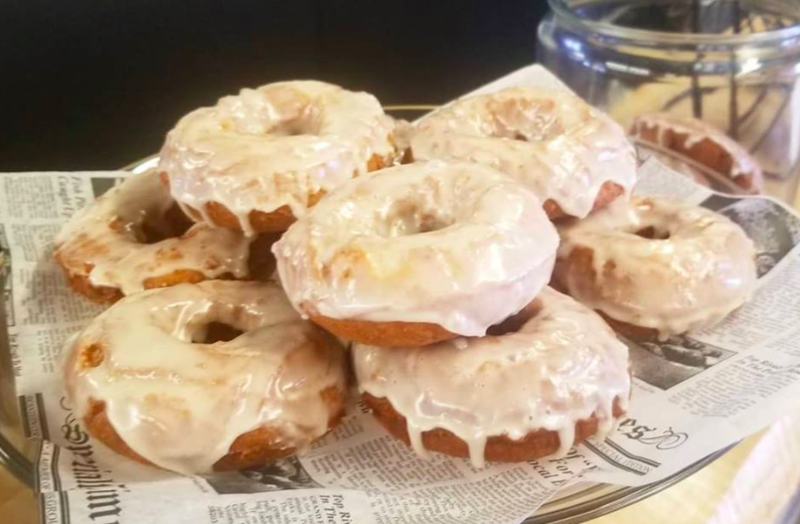 Maple glazed donuts at The Downtown Press Cafe. Owning and operating a food establishment is not new for the Strong area couple. Chris bought the Salem General Store when he was just 19 and ran it for the next 10 years. His dad helped him with things like a beer license that he was too young to sign off for. Though just a general store, Chris was always adding to the menu and perfecting what the store offered the public. "This was always way more of Chris' dream than mine, but I think I'm enjoying it more now," Brianna said, laughing. Chris has found his spot as the front-of-house manager, running the cash register, keeping the books and dealing with bills, while Brianna has easily taken to the kitchen side of things- creating unique treats like french toast cupcakes, bacon cinnamon rolls and honey glazed donuts. After searching for a home for more than a year, The Downtown Press landed in the former Sweet Ginger location and the Bracys said they can't imagine being anywhere else. "We always wanted to be downtown. We have a really diverse crowd here- parents, college kids, older couples...a lot of people have said we were what downtown needed, so that is nice to hear," Brianna said. The menu shows the Bracy's appreciation for being in town, with items named after favorited spots like "The Flint" (oven-roasted chicken with buffalo sauce, provolone and blue cheese) and "The Sandy" (a tomato, mozzarella and pesto panini), even including specials like blue and red themed cupcakes to go along with the Fire and Ice Festival a few weeks ago. The Bracys also pay tribute to their biggest fans (their children) with sandwiches like the "Ryker Roni" (pepperoni, mozzarella and marinara panini) and "The Benz" (oven-roasted chicken, pepperoni and and provolone). The Bracy family, doing what they do best (besides make paninis). Photo courtesy of The Downtown Press Cafe website. 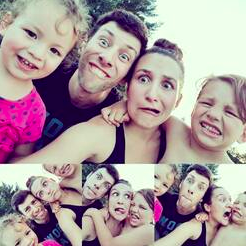 "We make family time a priority. Chris has weekends off, and one of us always picks Ryker up from school. But they love being here. They get to eat waffles, so they're happy," Brianna said. The panini-pressing duo said they have no plans of slowing down, and would even consider eventually expanding, but for now they're happy to be where they are. "We've found what we're good at here," Brianna added. For specials and drool-worthy photos of daily items, find The Downtown Press Cafe on Facebook or online. The "Press" is open 7 days a week from 7 a.m. to 7 p.m.
Good food and good people. Good luck to you both. The place is great. They even have a play area for the kids to use while you wait for your food. Very smart. Congrats guys, great job, miss ya up here but glad you followed your dream and achieved success. I will be in again . Awesome food. Service is great. Success to you both. Such a delicious option for breakfast or lunch. We've already found our favorites and look forward to supporting this yummy local business regularly. I have been there, and the sandwiches (Paninnis) are always a favorite. I bit of advice to a business such as this... Just don't expand too quickly. Keep the "homey" atmosphere. That's what people like. People get to speak to folks they haven't seen in a while. And people will wait for good food. This is a great place to eat. Their Panini sandwiches are great and so are the waffles. 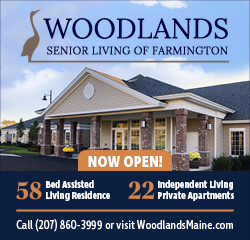 It is a great addition to downtown Farmington. Glad that they decided to set up there. I went here for the 1st time last week for luncn. Proud of you both! Keep up the great work! And for those folks that want to go off their diet, go for the dessert waffles. Be sure to get a two stacker. You will never eat plain waffles again!!! I've been twice and the food was great both times, but the play area for kids is my favorite feature since I have a preschooler! It makes the eating out experience more enjoyable for both of us when there is something for him to do while we wait to be served and it allows me to take my time and enjoy my coffee!